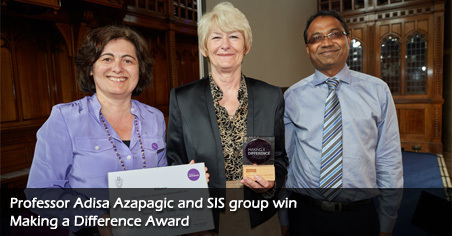 Professor Azapagic and her research group Sustainable Industrial Systems received the award from Professor Dame Nancy Rothwell for Outstanding Benefit to Society through Research for their work with CCaLC. This is the first ever award given by the University as part of the Making a Difference Awards for Social Responsibility. The Awards recognise the outstanding achievements of staff, students and alumni, and celebrate how they are all making a difference. CCaLC is a free, easy-to-use carbon footprinting tool aimed at industry. It has made a real difference in helping companies cut greenhouse emissions and achieve significant environmental improvements from ‘cradle to grave’. CCaLC has also been used successfully for engagement along supply chains, raising awareness and disseminating best practice for carbon reductions. By being freely available and developed for use by non-experts, CCaLC has helped to remove some of the major barriers to the uptake of carbon footprinting in industry and contribute towards the greening of supply chains. Watch the testimonial video: https://www.youtube.com/watch?v=sV0kxPNEMNI#t=13. For more information on CCaLC, visit www.ccalc.org.uk.